She could be descended from a Renaissance woman, or at least the portrait of one. Odilon Redon's Madame Arthur Fontaine (Marie Escudier) was made in 1903 but its subject is presented with all the signifiers of an unusual Renaissance painting that Redon and his contemporaries had seen and studied at the Louvre. Here is an obviously well-born woman, beautiful and virtuous as well can see by her modish dress and elegant profile as she bens studiously over he needlework. The left-facing profile and the arabesque-like arrangement of flowers as a framing device are part of a fascinating story told by David Alan Brown of the National Gallery of Art in the book Virtue and Beauty. 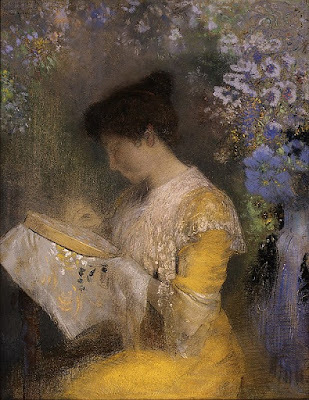 Mme Fontaine was the wife of a wealthy French industrialist and a patron of the arts whos circle included such forward-thinkers as the writer Andre Gide, composer Claude Debussy and several painters including Redon. 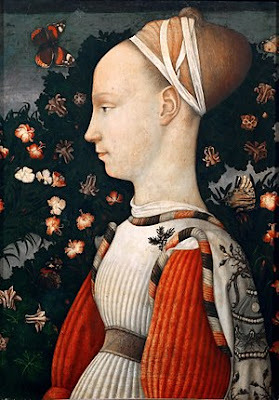 Antonio Pisanello's Ginevra d'Este had no precedent in the style of 15th century Florence. Rather than adorn his subject with precious jewels to suggest the wealth of her family he chose to portray Ginevra virtues otherwise: situating her in a virginal garden (hortus conclusus) where he surrounded her with shimmering spring leaves, perfumed carnation flowers and fluttering butterflies (symbols of the human spirit). We may wonder whether Redon was partaking of a no-classical moment in French art, as evidenced by contemporary paintings by Cezanne and particularly La belle Angele by Paul Gauguin (1889, Musee d'Orsay). 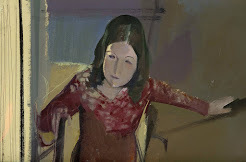 edon makes an appearance in a painting by his friend Maurice Denis, member of the once secret brotherhood of artists known as the Nabis (Prophets, in Hebrew). Although Gauguin was not included in the picture himself, it is a painting he owned by Cezanne (Fruit Bowl, Glass and Apples) on the easel that the other artists are gathered around. Redon stand a little separately from the group at their left, in the painting as in life. Redon's early graphic works in black and white are a virtual dictionary of bad dreams, and now as familiar from reproductions as the philosophical oddities of Rene Magritte. What makes Redon's pastels outstanding is his sure feather-light touch with the chalks themselves. The nameless blue flowers, interspersed with tiny starbursts of white and yellow seem to hang weightlessly in the air, with no other reason than to frame Mme. Fontaine's person as the white lace collar frames her face on her yellow dress. For Redon nothing in his work was ever merely decorative, it was part of a visual language to translate the mysteries inherent in the natural world for our eyes. Flowers, opined the artist, are "admirable prodigies of light" and, perhaps like Monet, Redon, rendered sensations in response to the contemplation of visible objects through invisible light. Virtue and Beauty: Leonardo da Vinci's Ginevra de' Benci: Renaissance Portraits of Women by David Alan Brown, Princeton, NJ, Princeton University Press: 2001. 1. Odilon Redon - Madame Arthur Fontaine (Marie Escudier), 1903, pastel on paper, Metropolitan Museum of Art, NYC. 2. Pisanello - Ginevra d'Este, c.1435-49, tempera on wood, Louvre Museum, Paris. Les jaunes et les bleus de Redon sont merveilleux - entre autres.